Little Loveston is a group of five traditional stone cottages to sleep up to 12,10,7,4,2 all with their own private gardens and set in mature, landscaped grounds. We are surrounded by organic farmland and woods with great walks from the door. 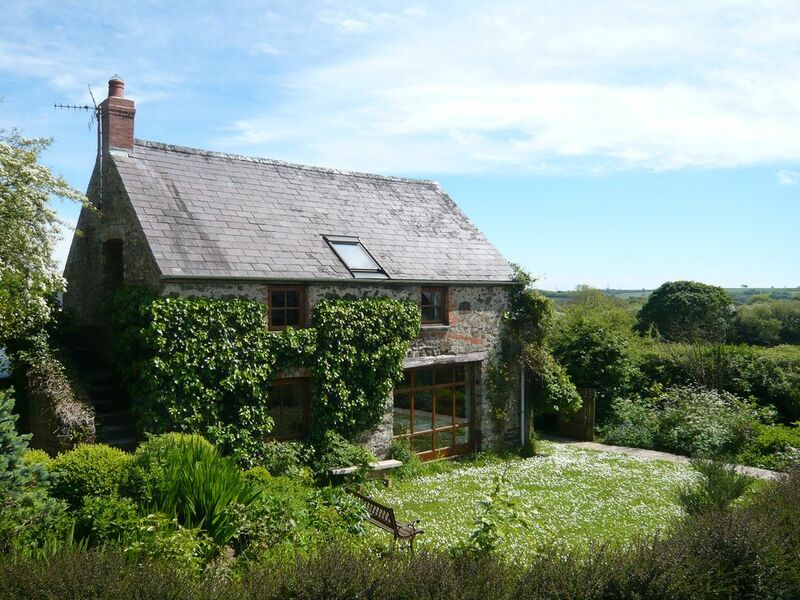 We have a central yet rural location close to many beautiful sandy beaches and Little Loveston is an ideal, relaxing base for exploring the Coast, Countryside and Attractions of Pembrokeshire. The cottages are all comfortable and well-equipped, all have private, enclosed gardens, we have installed an environmentally friendly biomass boiler to provide central heating and hot water, there is wifi throughout and all have woodburners for cosy evenings. We have carefully restored the buildings, both to retain the original character and create lively, functional living spaces. There is also a Gamesroom with table tennis and pool, outside Playareas - swings, slide, fort, sandpit with caravan, football field. Little Loveston is a peaceful place that our visitors often return to again and again. Little Loveston makes a great base from which to explore the counties beaches, attractions, waterways and countryside. It is also on the Landsker trail so there is good walking and cycling from the door. The immediate surroundings have been designated a Site of Specific Scientific Interest because of its rich and varied plant and wildlife and we are also close the the Cleddau Estuary (Pembrokeshires Secret Waterways) and the ancient woodlands at Canaston and Minwear. The cottages are well equipped with informative brochures and walking maps. The beautiful sandy beaches and pretty towns, Tenby and Pembroke, of South Pembrokeshire can be reached in 20 minutes and the more rugged coastline of the North and West are 45 minutes away. For excellent local produce we have Yerbeston Farm Shop 100metres up the road and the lively market town of Narberth, with all manner of shops, cafes and galleries is 10 minutes drive away. Our local pub is the Cresselly Arms, down on the waters edge – well known for its setting and a great place to watch the sun go down. The big family attractions of Oakwood Theme Park and Folly Farm are only 10 minutes drive away and many other visitor attractions such as Heatherton Country Park, Manor Park Zoo, The Dinosaur Park and Pembroke, Carew and Manorbier Castles – all well within 20 minutes drive. Then it’s great to come back to Little Loveston at the end of the day for some peace and quiet! Pembrokeshire is a small county with loads to see and do so we particularly wanted a good central location that was also rural and think we have the perfect spot! By building up Little Loveston slowly and thoughtfully - and we love living here - we find that many of our visitors appreciate the extra lengths we have gone to in making the buildings lively and comfortable and the relaxed, generous feel of the surroundings. The place has, of course changed considerably since 1993 but the lushness and friendly feel has remained. The surrounding fields and area remain unchanged and, of course, the central location is always appreciated. We really enjoyed our stay at Little Loveston cottages. The farm house was a great space to all come together after a long day walking and climbing. The children enjoyed gardens and chickens and we had tears leaving the chickens behind! The games room was a hit too! Little Loveston is ideally located for seeing the Pembrokeshire coast and we travelled and hiked parts of the coastal path each day. Although we didn’t use them, there are more than enough family attractions to fill a week all within 15 mins of the cottages. We made our own fun exploring the beautiful coastline and woodland walks. Thank you for a lovely stay! Lovely cosy farmhouse, a real home from home. Situated perfectly for attractions, touring, and beaches. Comfy farmhouse, very warm, every home comfort provided and welcomed with a cake - lovely. My three grandchildren loved the games room and it was great that there was plenty of space for them to run about and play. Will definitely return. Brilliant place to stay, extremely well stocked and equipped facilities. Very homely feel throughout. The children of all ages loved the gardens. Having the fire at night added a lovely homely feeling. Little Loveston is on the edge of The Pembrokeshire Coast National Park – with 186 miles of coast path, coves and sandy beaches as well as the Preseli Mountains with great views of the counties’ peninsular and where the bluestones at Stonehenge come from. The coastline varies from rugged cliffs in the North to long sandy beaches in the South and West and includes Barafundle beach, voted one of the best 10 beaches in the world by National Geographical. There are many other beautiful sandy beaches on the South Coast including; Freshwater West-a large wild expanse of dunes rock pools and great surfing; Broadhaven South with fantastic walks around Bosherston Lily Ponds and Stackpole. Also The area is steeped in history with an iron age settlement rebuilt at Castell Henllys and the many castles nearby such as Pembroke Castle, Carew Castle, Manorbier Castle built following the Norman conquest to create the Landsker line and ‘little England beyond Wales’. Pembrokeshire is famous for its wildlife with boat trips to the islands to see the bird reserves as well as marine life such as seals and porpoises. There are many facilities offering opportunities for fishing, horse riding, golf, watersports as well as the tourist attractions such as Oakwood Theme Park, Folly Farm, Heatherton County Park, Manor Park Zoo, and Gardens at Picton Castle and Colby Woodland Garden and Upton Castle. A great place from which to explore the counties beaches, attractions, waterways and countryside. Little Loveston is also on the Landsker trail so there is good walking and cycling from the door. The immediate surroundings have been designated a Site of Specific Scientific Interest because of its rich and varied plant and wildlife and we are also close the the Daugleddau Estuary (Pembrokeshires Secret Waterways) and the ancient woodlands at Canaston and Minwear. The cottages are well equipped with information brochures and walking maps. The Blue Lagoon at Bluestone is just up the road - a waterpark for rainy days and there is great cycling from here down around the Estuary - to Cresswell Quay for a drink and then on to Lawrenny Tea Rooms for crab sandwiches! In the west of the County is a great choice of beaches for surfing, body boarding, swimming and lazing by - Marloes - a favourite of ours, Newgale, Dale for sailing and diving nearby, then up to St Davids to see the Cathedral, walk along the fantastic cliff tops on the coastal path and sandy beaches such as Whitesands. On the North coast you have the pretty towns of Newport, Fishguard and The Blue Lagoon at Porthgain -great food too at The Shed for seafood and The Sloop Inn afterwards for a pint. The beautiful sandy beaches and pretty towns, Tenby and Pembroke, of South Pembrokeshire can be reached in 20 minutes and the more rugged coastline of the North and West are 45 minutes away. For excellent local produce we have Yerbeston Farm Shop 100metres up the road and Tessas organic veg stall by Cresswell Quay. The lively market town of Narberth, with all manner of shops, cafés and galleries is 10 minutes drive away and our local is the Cresselly Arms, a traditional pub serving ale from the jug down on the waters edge – well known for its setting and summer barbecues and duck race - a great place to watch the sun go down.